Incorporating the crackles and hiss from a vinyl record into your digital production adds a subtle layer of dusty soul to your track. Although dedicated vinyl-simulation plugins like iZotope Vinyl and Milli Vinylli can create digital vinyl noise, using a sample of an actual record will give you the most realistic result. If possible, record an empty part of a vinyl record from a turntable into your computer; if not, you can download a piece of recorded vinyl crackle from Freesound. Drop the recording into your DAW; I’m working with a mixed track here, but you can incorporate the vinyl crackle at any stage of the mixing process. 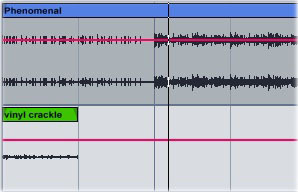 Look for a section of the recording that’s free of any major pops or skips and trim it down; make the trimmed section as long as possible (four bars at a minimum). Click on the crackle clip to open its waveform view, then crank up the clip’s gain so you can see its transients more clearly. Use warp markers to move the crackle’s major transients so that they fall on note divisions; this will make the crackle sound more like it’s part of the track, rhythmically speaking. Don’t worry about matching up all the transients to notes — you want to keep some degree of randomness in the sound. Turn the gain back down when you’re finished. 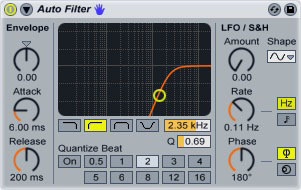 Put a high-pass filter on the crackle to cut out the lower frequencies. Start around 2 kHz and move the cutoff around until you find the sweet spot where the vinyl sample sits in the background of the mix, adding a subtle texture to the sound.